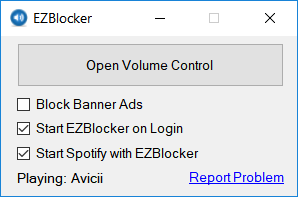 After last or previous Spotify update (some two weaks ago) EZBlocker prevents playing of songs not in my playlists (not even possible to add new songs into playlists). Bug is only fixed after new installation of Spotify but reoccurs after EZBlocker is started . Needed an ad-banner blocker because these horrible banners take too much of cpu usage. It’s not loading Spotify when I use EZ. The screen stays black.